DEL MAR, Calif. – Next weekend the 25th running of the $1 Million TVG Pacific Classic at Del Mar, the Seaside Track’s signature and most prestigious race, is set to bring the elite summer racing season to a peak. The high stakes weekend will be packed with events and entertainment, starting off on Friday, August 21, with a free performance by San Diego based reggae fusion rock band Pepper. Harrah’s Friday Concert Series with Pepper – Friday, August 21, island-rhythm rock band Pepper will perform a free concert. The concert will start following the final race of the day, approximately scheduled for 7:30 p.m. Concert is 18 and up. $1 Million Pacific Classic – Saturday, August 22 – Del Mar will draw some of the nation’s most talented Thoroughbreds for the most esteemed race of the season: the $1 Million TVG Pacific Classic. 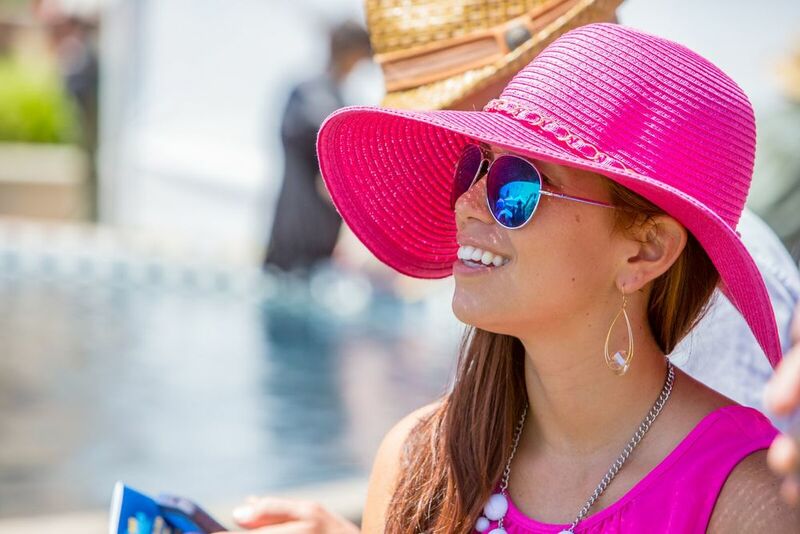 The Pacific Classic will bring horse racing enthusiasts out in their finest summer suits, sundresses and spectacular hats for a day much like Opening Day at the historic Seaside Oval. First post is 2 p.m., gates open at 11:30 a.m.
Daybreak at Del Mar – Every Saturday and Sunday fans have the chance to view racehorses galloping on the track during Daybreak at Del Mar from 7:30 – 9:30 a.m. Early risers can watch the morning workouts while enjoying hot breakfast sandwiches, fresh coffee, juice and more for purchase. American Pharoah fans can also catch the Triple Crown champ galloping around 7:45 a.m.
Family Weekends – Every weekend is family weekend at the track, where children can enjoy activities in the Infield such as: inflatable games, pony rides, jockey stilt walkers and more while catching a 360-degree view of the track. Children receive FREE racetrack admission, adults are only $6. Racing at Del Mar happens Wednesdays through Sundays, July 16 - September 7, with post time for the first race on most days at 2 p.m. On Fridays first post is shifted to 4 p.m. For more information, call 858-755-1141 or visit www.delmarscene.com. You can follow the Del Mar racetrack on Twitter and Instagram @DelMarRacing or become a fan on Facebook/DelMarRaces.